Where Is Elvis Presley Buried? Elvis Presley died on August 16, 1977. He is buried in the Meditation Garden at Graceland mansion at 3764 Elvis Presley Boulevard in Memphis, Tennessee. Graceland was Elvis’ home from 1957 until his death in 1977; it opened as a museum in 1982. It receives more than 600,000 visitors from around the world each year, making it one of the top attractions in the city and one of the most-visited private homes in the world. After Elvis’ death, his body was interred in a mausoleum in Forest Hills Cemetery in Memphis. His mother was moved from her original gravesite to join him there. Elvis' private funeral was held on Thursday, August 18, 1977. There are reports that more than 75,000 people flocked to Memphis to pay their respects to Elvis, and mourners were spread out for miles along Elvis Presley Boulevard in front of the Graceland Mansion. Several months later, there was an alleged attempt to tamper with the grave, and soon after both bodies were moved to the Meditation Garden at Graceland. 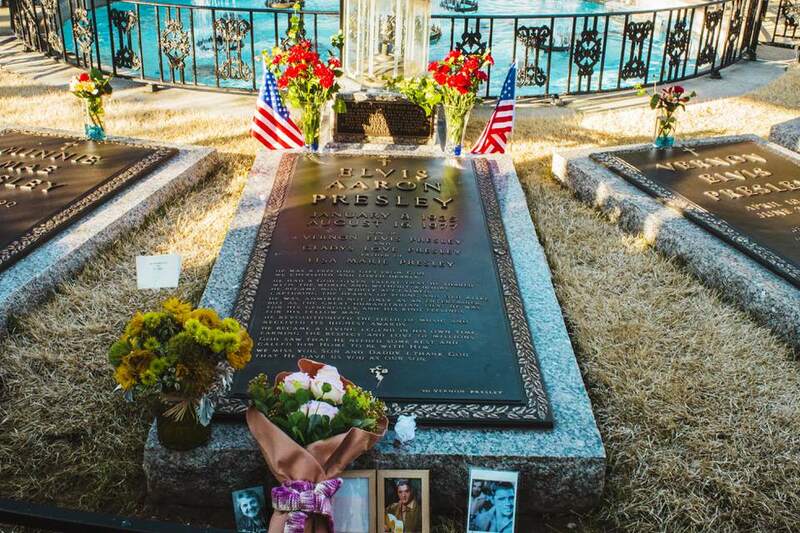 Today, fans of the King of Rock ‘n’ Roll can make a pilgrimage to his final resting place, where his parents Vernon and Gladys and his grandmother Minnie Mae are also buried alongside him. There is also a memorial for Elvis’ twin brother, who died at birth. You can visit the Meditation Garden at no charge from 7:30 a.m. to 8:30 a.m. every day except Thanksgiving and Christmas. In order to participate in this “walk up” option, be sure that you are inside the gate before 8:30 a.m. and that you leave the grounds before Graceland tours begin at 9 a.m.
For the full Graceland experience, purchase a tour ticket to visit the mansion and grounds. Tours are available, in general, Mondays through Saturdays from 9 a.m. to 5 p.m. and on Sundays from 9 a.m. to 4 p.m. There are special hours on holidays and for events; you can view the detailed hours for tours on the Graceland website. The basic Graceland Mansion Tour allows guests to see the mansion interior and grounds and walk past Elvis’ grave in the Meditation Garden. Special Platinum and VIP Tours include additional exhibits such as Elvis’ Automobile Museum, special archives, and his two custom planes. You can also take a 360-degree virtual tour of the Graceland grounds, including the Meditation Garden and Elvis’ grave, via Google Trekker. Graceland hosts Elvis Week every August, which celebrates Elvis’ life with eight days of events in Memphis. This week attracts thousands of Elvis fans from around the world, many of whom attend the week’s signature event: the Candlelight Vigil. Every August 15 at 8:30 pm., Graceland invites guests carrying candles to make a procession up the driveway to the Meditation Garden and past Elvis’ grave. The solemn event is free and no reservations are required. It usually takes until the early morning of August 16—the date of Elvis’ death—for the crowd to disperse. Other popular times to visit Elvis’ final resting place are during the Elvis Birthday Celebration in early January and during the Christmas holidays, when Graceland is illuminated in blue lights and traditional Christmas decor. Did Elvis Have Any Siblings? Is Elvis Presley Actually Alive? How Much Is My Elvis Memoribilia Worth? Was Elvis Born in Memphis? What Was Elvis Presley's Middle Name? What Was Elvis Presley's First Record? How Many Children Did Elvis Presley Have? Does Elvis Have Any Grandkids?